Even straight men go for boldly colored footwear! Find out which fash piece this TV personality, writer, and yoga instructor can't do without. 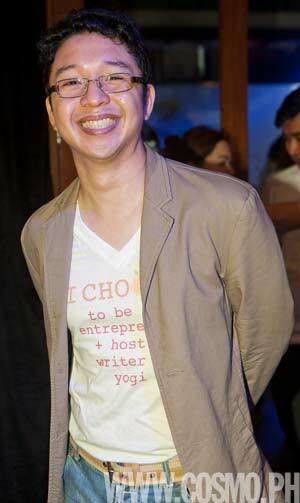 You may know RJ Ledesma as a host on GMA News TV's Best Men, actor, writer, magazine editor, entrepreneur, or you may even have attended one of his yoga classes! Who would've thought that the cheeky kid from the Royal Tru-Orange commercial would become a certified yoga instructor? We could all learn a thing or two from RJ, who manages to wear many hats and still make time for his son and wife. When RJ was introduced as brand ambassador of vitamin juice drink brand Smart C+, he said, "You know, I never thought 10 years ago that I’d be doing what I love. I love being an entrepreneur, I love writing, I like editing, I like hosting, and most importantly, I am a father and a husband. And for me, this is what life’s all about." We chatted with this 21st-century Renaissance man about fitness, style, and the fashion find he loves so much. Read on to get to know RJ better! I’m a yoga practitioner. I’ve been practicing Ashtanga Yoga for the past seven years, and I’m also vegetarian, and I’m a father to a toddler. So that’s pretty much my workout regimen everyday. When it comes to fashion, what’s your personal style? It’s very simple. First of all, I’d like to make sure that what I’m wearing is well-fitting, to stay in shape lang, at the same time clothes which ought to complement skin color, skin tone, well-fitting clothes. For me, that’s the most important thing to show your personality. Whether it be T-shirts or anything, you have to be more unique, you have to give it more standard, particularly in a business where you’re a personality, where you’ll do things that will make you stand out and think about your character. Is there one item from your closet that you always wear? I have a nice pair of red loafers in the house and I like them a lot, those are the things I like to wear. Just my guilty pleasure: my red loafers.